Once upon a time school was pretty boring. Yawnnnn. But learning outside, well that was fun. Soccer/Baseball stats? Check. Pokemon evolution? Check. Hmmm this “games” thing really works. And you know what, that worked too! But … these games became a little too powerful. So now they’re limited to VIPs. Choose your games wisely my good friend. VIP Owners Click Here for the NEW VIP GAMES MENU. TPR Warm up – the perfect start to every lesson, add new words every time. Lines Quiz – highly recommend for those with regular lessons. Online Video Workshop – the basics. Nemo Game – What can you see…? Harry Potter – very popular at the moment! How old are you? Bingo with a twist! These are games where the kids have to use questions / answers, and practise sentences as opposed to simply learning vocab. If you teach in Japan, where kids can already understand several hundred English words, they are recommended to help the kids see how these words fit together. Target language : Any Conversation, “My name is ….” “How are you?” etc. 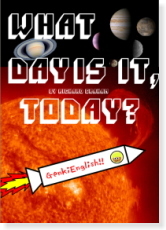 Target language: “What time is it? These are printable worksheets/games to go with the Teacher’s Set. 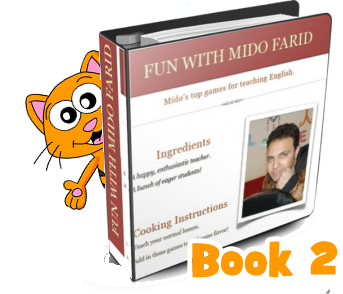 Mido Farid has a new game for your every Monday. 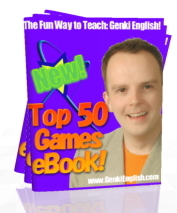 If you can’t click them all right now, sign up for the Genki English blog and get a brand new one delivered each week! 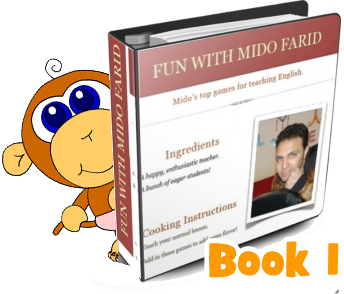 VIP Members can also download all Mido’s games in his brand new ebook! Witches Brew – the opposite of the game above! BRAND NEW on the NEW VIP GAMES MENU. Danger Island – a Treasure Adventure! Circle My Clothes – clothes review! Freeze – great classroom control technique! Circle or Chair? – kindergarten fun! Cha Cha Pizza – Any questions. Kiss Sara – super cute game! Magic Matchbox Game – How many? “Pig!” – review lots of questions! Happy Bunnies – great Easter review! Dice attack! – Halloween or any review! – all with Japanese explanations! Some of these games only need 2 or 3 players. For larger classes, once you’ve done a demo at the front, split the kids into 3 or 4 groups, put them in a circles and the kids take turns in going to the middle to play. Target language: Left, right, forward, back etc. Simon Says Please polite version of classic game! This is a really fun on-line game!! You could play for hours! Great for a first lesson! or VIP members can now download the brand new Top 50 Games eBook! Choose a target theme from the Curriculum, then a game to practise the English. 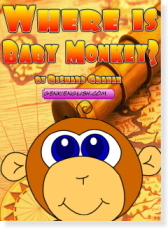 Learn & Play: Before you play these games you will need to make sure the kids have a basic grip on the target English. The kids have to have fun, but they also have to be progressing with their English skills. Songs instead of drilling: Drilling can be boring, but songs with actions are a fun alternative. Set the level: A game for a game’s sake is no good – choose a game that will let them practise their target language. If it’s too easy or too difficult it won’t be very effective! Motivation: Games provide extra motivation to learn the target language – learn the new language, win the game! Everyone: Good games allow the kids to practice with their peers – the best games allow all the kids to speak at once. It’s the kids: The lessons become less teacher orientated and more student orientated. 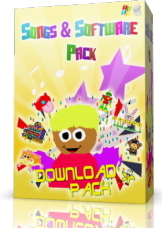 Fun: And the biggest advantage of using songs with games is that they are FUN!! They become so engrossed in the game that the English becomes second nature. It’s a bit like driving a car, what you concentrate on is the road, the skill of moving the pedals becomes second nature through practice. You never truly lose until you stop trying. If everyone is having fun, everyone is a winner! Think “I can do it!” and you can! Let the kids know it’s not brain surgery, it’s just English and is one of the easiest subjects they’ll learn at school. Mistaikes: Just like baseball, practice is the key. But unlike music education where “only perfect practice makes perfect” in these games the kids have dozens of chances to make mistakes and perfect their English. Lego: Each of the themes is structured so that kids can chop and change, build and rebuild new English just like in a Lego set. The Next Step: Then you can add connector words like “and” or “but” and join the bits and pieces together to eventually lead up to where the kids can say anything they want to say in English. It won’t be 100% correct, but they will be able to get their message across, and that’s an important milestone. Easy Planning: Nearly all of these games are illustrated with photos of them being used in the classroom. For teachers in Japan there are translations into Japanese – simply hand a copy to your teacher for easy lesson preparation! Espanol: But it’s not just for teaching ESL or English, nearly all these games work great for teaching ANY language. 45 Mins: Have a look at my lesson plan page to see how to fit these games into your classes. Soccer / Can you …? there are more to come soon …. If you’re not a VIP Owner yet, access to all these fantastic games is included with the Genki English Teacher’s Set!